Thought for the week: STOP MAKING STUPID PEOPLE FAMOUS. I have long thought that many heavy use armored vehicles (tanks, self propelled guns, missile launchers, etc.) should use the same basic chassis. The US does that with the Stryker wheeled vehicle, but it doesn't extend as far as it does to other systems in my opinion. The Russians "stole" my idea...but it didn't work out all that well for them when the new tank went on display during their Victory Day Parade (was May Day Parade in the USSR). 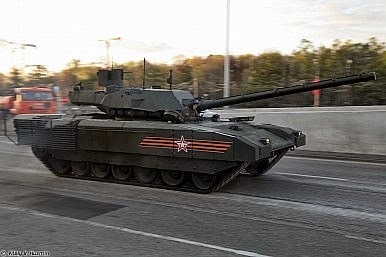 The first major tank to be developed in Russia since the collapse of the Soviet Union abruptly grounded to a halt during a rehearsal for Moscow’s big May 9 Victory Day parade, Reuters reports. I'm sure you heard about the "draw Mohammed" contest in Garland, TX and the two jihadis who showed up to the party. So it's not news that you haven't heard of. Some people such as Donald Trump, the comb-over king of New York thought that it was a bad idea. I think that Pamela Geller needs to have streets named after her. What a great idea. It wouldn't fly in the blue urban hells, but in Free America (and there are still significant portions of the country that are), it plays well. 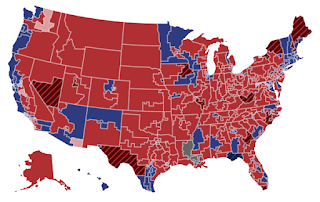 Jihadis are neither loved nor respected in Free America (the area that shows up red on the electoral map). Muslims are usually tolerated to the extent that they hold themselves accountable to the same laws as the rest of the nation upholds...you can't honor-kill people who you don't like and bury them in the back yard, men can't beat their wives (avoiding their faces as proscribed by the Quran), and if somebody draws a cartoon of the long dead prophet of Islam, you can't kill them either. The map showing areas where jihadis are not loved is provided for reference (above-right). I realize that it's coincidental, but Hillary is not loved in any of those areas either. Make of that what you will because at this point, what difference does it make? Americans are wondering whether or not the Federal Bureau of Investigation is a wholly owned asset of the Democratic Party. Since the FBI answers to Barack Obama, one can answer that it naturally is...just the same as the Internal Revenue Service (paragon of political virtue) is. The FBI did take all references to Islamic Terrorists out of their OPFOR exercises - which makes absolutely no sense. A Kazakh official involved in brokering a controversial mining deal for a major Clinton Foundation donor is behind bars for his role in the transaction, undercutting a Clinton campaign "fact-check" that attempted to dismiss ethical questions about the former president's ties to the lucrative contract. Former President Bill Clinton RESPONDS. Hillary for America and the Clinton-aligned group Media Matters pushed back on allegations that the Clintons had used their political clout to drum up millions in foundation donations and speaking fees by furthering the financial interests of friends in the wake of Tuesday's publication of Peter Schweizer's Clinton Cash. Attorney General Loretta Lynch announced Friday the Department of Justice will launch a federal civil rights investigation into the practices of the Baltimore Police Department. I find it interesting that of the people involved in the death of the criminal, the principal suspects and the sergeant (supervisor) are black (African-American/American-African or whatever). Moreover all senior officials at the City of Baltimore are black (same caveat disclaimer). AG Lynch is also black. So is the President of the United States (only half-black but he repudiates his white half) and his fact-finder, the tax cheater, and holy man, Reverend Al Sharpton. So why do I have a nagging suspicion that this will end up being a "white problem"?